Club Penguin Cheats by Mimo777 Club Penguin Cheats by Mimo777: UK Players: Win a Club Penguin Moderation Master Class! UK Players: Win a Club Penguin Moderation Master Class! 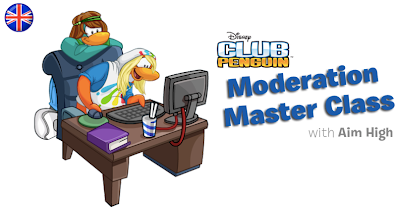 As you know, Club Penguin has a huge team of trained moderators all around the world, helping to keep Club Penguin safe. The support team also receives a load of emails from us asking to come and visit one of the offices, to learn more about what it takes to be a CP moderator. Well, Check this out. As part of Aim High, CP is offering the chance for 5 UK players to win a day trip to their office in Brighton on 31st July, where they'll get a unique opportunity to meet the CP team and take part in a Moderation Master Class! Awesome, yeah!? The closing date is Monday 22nd July at 9am (UK time), so if you want to enter you better be quick! not sure if you know this BUT AWESOME STAR WARS CODE-BARONFELL totally works. what happend to your stuff mimo?